This page will have all my recommendations for different software, tools, and resources I use. It will be updated as I continue to use and discover more tools and methods. If you have any suggestions, feel free to add them in the comments. Note: Some of my links are affiliate links which I will make a small commission on at no cost to you. InMotion Hosting – The company I use for all of my websites. I’ve never had a problem with downtime and they have excellent customer service. Mailchimp – A great way to send out your e-mail newsletters. They have a great, easy to use interface, beautiful e-mail templates, and there’s also a free tier. WordPress.org – One of the easiest to use blogging platforms available. Almost every big blogger you see is using WordPress and I am as well. Choose Yourself! – In this book, James Altucher shows why we all need to start doing things for ourselves instead of relying on middle men. A great motivational book for those who want to start choosing themselves. Make Art Make Money – Make Art Make Money by Elizabeth Hyde Stevens is a gem of a book. Before reading Elizabeth’s book I didn’t know much about Jim Henson’s life and career. After reading it I feel like I went along on his journey. The Obstacle is the Way – The brilliant Ryan Holliday explores some of the greatest leader and thinkers in history and shows how they used stoicism to turn trials into triumphs. Steal Like an Artist – Austin Kleon has written one of the great manifestos of being a creative person. This book tells artists how to learn from and explore the world. 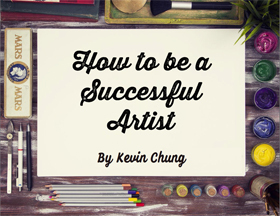 It is a must read for any artist. Creative Live – One of the best ways for artists to learn online. There are classes on photo & video, art & design, music & audio, craft & maker, and money & life. Cracking Creativity – Cracking Creativity is my very own podcast. In it I show you how creatives turn their ideas into action, create interesting projects, and build an engaged audience through shared passions. The Fizzle Show – The Fizzle Show is a podcast for creative entrepreneurs and honest business builders who want to earn a living doing something they care about. The School of Greatness – The goal of the School of Greatness is to share inspiring stories from the most brilliant business minds, world class athletes and influential celebrities on the planet; to help you find out what makes great people great. Smart Passive Income – Pat Flynn from The Smart Passive Income Blog reveals all of his online business and blogging strategies, income sources and killer marketing tips and tricks so you can be ahead of the curve with your online business or blog. The Tim Ferriss Show – In this show, Tim Ferriss deconstructs world-class performers from eclectic areas (investing, chess, pro sports, etc. ), digging deep to find the tools, tactics, and tricks that listeners can use. Unmistakable Creative – Candid Conversations with Creative Entrepreneurs and Insanely Interesting People – Guests on The Unmistakable Creative have included happiness researchers, ex-cons, peak performance psychologists, graffiti artists, best selling authors, successful entrepreneurs and world famous cartoonists.